The CBx Services offering aims to provide bespoke advisory that improves clients’ understanding and awareness of the building energy performance and helps to narrow the ‘performance gap’. A partnership with the UCL Energy Institute helps CBx to provide robust, up-to-date knowledge and support for its members through the Institute’s collection of on-going building energy consumption research projects and databases. The two main areas of focus for CBx services are; benchmarking & improvement of buildings and consultancy and support at specific capital spends such as handover or refurbishment. Using the CBx Upload Form which asks for 16 simple data-points for each building. This will provide a picture of your portfolio, the spread of data and the highest and lowest consumers within it. This exercise will identify candidate buildings for further investigation. In addition to understanding the spread of data in your portfolio, we are able to perform a benchmarking study to determine the performance of your assets as a comparison to other figures. Assets against sector specific indicators: for example, kWh/m2/£1000 profit or kWh/m2/guest. An initial site visit and client interview will provide the context for refurbishment advice. The team will need to access any available building information – log books, O&Ms, drawings and will need a full year of energy use data for the building in order to establish its current performance and benchmark any prospective improvements. Refurbishment options will be drawn up including any pertinent design suggestions for passive improvements and improvements that will complement any technology implementation; draft lobbies, light wells etc. An impact assessment of each fabric option will be made including cost, disruption, likely energy and carbon savings and payback period. This service will begin with light touch benchmarking exercise and an investigation of relevant legislative obligations and targets to identify buildings for refurbishment. Refurbishment options will be drawn up based on site visits, structures interviews with key members of staff and a desktop study based on available building information – log books, O&Ms, drawings etc. An impact assessment of each option will be made including cost, disruption, likely energy and carbon savings and payback period. It takes many trades and specialists to deliver a building, particularly one with a large amount of technology. A recent £8million Government funded Building Performance Evaluation study has highlighted handover and commissioning as one of the major trip points for effective operation and energy performance of a building. The commissioning and handover programme is often susceptible to being squeezed as job overrun and occupants need to move in. The Handover Management Service ensures joined up thinking and installation across all trades and works with the future building and facilities managers to ensure a clear understanding of the systems and their intended use. In order to ascertain a building’s effectiveness in operation, understand occupant satisfaction and to assess its performance against design targets. It is undertaken in three parts; a forensic walkthrough to assess the building’s operation and to identify any anomalous processes or observations, an energy survey to determine the energy end-use breakdown and an occupant satisfaction assessment which includes surveys and interviews of building users and occupiers. Recommended as on-going care and maintenance following a full Building Performance Evaluation or the handover management services. This service will include a site visit, a meeting with key building management personnel, an interrogation of the Building Management System and other checks as required in order to establish any diversion of the building operation from the design intent. Where gaps are uncovered, a corrective action plan will be put together alongside any further recommendations for boosting the efficiency of the building. 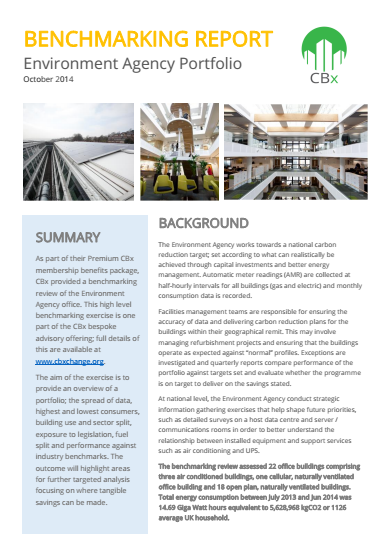 CBx have also recently completed a high-level benchmarking report for the Environment Agency’s portfolio of 22 office buildings, which has allowed us to identify specific areas of focus for further investigation. By benchmarking the assets against the rest of the portfolio, the highest and lowest consumers have been illustrated and the Agency’s immediate exposure to carbon legislation and costs; the worst performing building across the analysis has been earmarked to target for post occupancy evaluation and energy reduction. By comparing figures to industry benchmarks, CBx identified problem areas across other buildings; buildings with high gas usage will be investigated for fabric performance, any causes of a high air-change rate that would increase heating demand and the size of any other end use consumption supplied by gas. Similarly, buildings that have been highlighted as having high electricity demand will be examined in order to disaggregate or split the demand into end uses to understand where it is being used. In this way, energy reduction interventions can be targeted, effective and financially viable. For organisations with large portfolios, this targeted, high-level benchmarking activity is essential to streamline processes and avoid unnecessary work.